#1,431 Bean Boots + Miracles. – Laurel Mercantile Co.
Now reading: #1,431 Bean Boots + Miracles. #1,431 Bean Boots + Miracles. 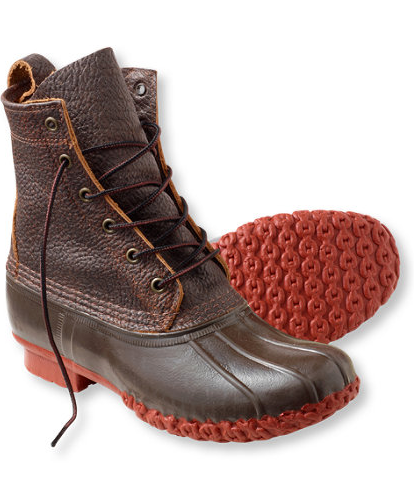 Last Christmas, mama and daddy gave me a pair of those Bean boots that I’ve always thought were so cool. I’ve been stressing over what shoes to pack for the trip and since I’ve ultimately decided that riding boots, while fashionable, aren’t the most comfortable for the amount of walking we do when we’re there. And I remembered the ole Bean boots. And I slipped some athletic insoles into them and tried them out on our late walk tonight. Bingo. Like sneakers. I might look ready to duck hunt or chop wood but who cares? Which I will gladly elaborate on at a later date. But today a very good thing happened. The best thing, for sure. #1,430 Larry David + The Socks.